As a teacher of twenty five students, I highly recommend private lessons. For those on the go, wishing to learn what they can, this is the place for you. It takes years of study to play the piano correctly. I will only be touching on the finer points here. Feel free to post any questions pertaining to this lesson at the bottom. Today we will learn the white keys. 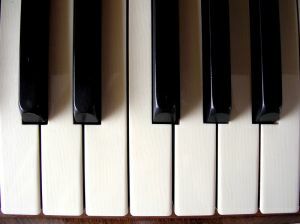 The white keys on the piano repeat themselves from left (low notes) to right (high notes) every seven notes. This means that every eighth note is the same key. We name the keys simply A, B, C, D, E, F, G, and then back to A, B, C, D, E, F, G, and then back to A, B, C… you get the point. Black keys help you find the white ones. They are are grouped in threes and twos. Find and play all the groups of two black notes on your keyboard. Find and play all the groups of three black notes on your keyboard. Notice that three white notes surround a group of two black notes. Press down the three white notes using the pointer, middle, and ring finger of your right hand. Play the note attached to your pointer finger. You have just found C. Find all the Cs on your keyboard. Do the same on the left hand. Now your ring finger is playing C.
Notice that four white notes surround the group of three black notes. Press down the four white notes using the pointer, middle, ring, and pinky finger of your right hand. Play the note attached to your pointer finger. You have just found F.
Find all the Fs on your keyboard. Do the same with your left hand. Now your pinky is playing the F key. C is the white key directly left of the two black notes. F is the white key directly left of the three black notes. Place your right hand thump on the C in the middle of the piano. Place all the other fingers on a note nearest to them. Keep the fingers curved so that the finger tips are lined up with each other. Practice playing the C and F using your thumb and ring finger. Place your left hand pinky on any low C on the piano. Place all the other fingers on a note nearest to them. Keep the fingers curved so that the finger tips are lined up with each other. Practice playing the C and F using your pinky and pointer finger. ← Announcement : Void Voyage 1 is Comming Soon! I enjoyed going through your blog.. 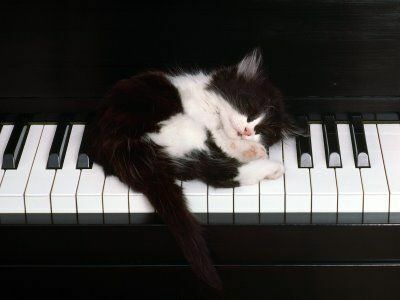 If there is something i would wish to do for myself is learn how to play piano. It seems hard when i looked in the details.. i thought i can just put my finger and try playing it . Anyway .. its really awesome to have it all clear in your blog . Thanks for reading. I have heard so many people tell me the same thing you have. Most just don’t have the time for lessons. It takes a lot of work to learn piano, but it is very rewarding and the work can actually be fun if you allow for it:) Don’t be stressed out if you don’t get the concepts right off the back. Take your time. Mistakes are the stepping stones to learning how to play. As long as you can find the mistakes and fix them, eventually it will all be second nature. I am trying to see if I can teach people piano by using simple, easy to understand lessons. let me know if I am successful in this. If nothing else I can teach a few of the concepts so that when you do have time for lessons you will be well on your way to correct piano playing. Don’t give up! I have a firm belief that everyone can play piano on some level. Find yours and enjoy! deepwellbridge :Thanks for reading. I have heard so many people tell me the same thing you have. Most just don’t have the time for lessons. Don’t give up! I have a firm that everyone can play piano on some level. Find yours and enjoy! I remember , years back , trying it once when i was at my friend’s place, it was really a wonderful feeling. I wish i was able to study it .. some things are easy to say but hard to do or infact impossible. @ ? Well infact i do have some?↲You might like 2 have a look @ my blog. I was wondering how to check your blog out. For some reason your name doesn’t directly connect to your blog. ps. or rather… your avatar connects to your gravatar but there is no wordpress site on your gravatar. I want lessons of easy way to learn keyboard. Learning an instrument is difficult for most people. It may take time to understand and play the music, but with consistent effort and the correct training you can become a good pianist. Along with that training comes the natural god-given talent. This is different for every person. Some have a naturally good ear. They can hear the tunes and match those sounds very quickly with the proper keys. Mozart is an extreme example of this. Others have a gift at memorizing things quickly. And still others simply have the gift of stubbornness and the tenacity to never give up; they will work harder then anyone to match the music on the page. Beethoven is a good example of that. So in short, it takes good training or extraordinary talent to become a good musician. It takes both to become a master.